FORT WILLIAM - (CP) - Airport employees said Wednesday they watched five "unusual" objects streaking through the sky like "brilliant white balls of fire" at about 1:45 p.m.
Trans-Canada Air Lines officials witnessed the phenomenon. Said one: "I never saw anything like it before. I won't say it was a flying saucer. But it sure was unusual. Its speed must have been terrific." 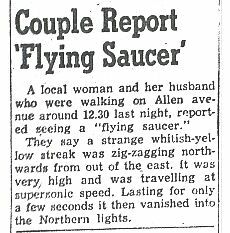 TIMMINS - (CP) - Newspaper telephones buzzed Monday night as residents reported the third "raid" of flying saucers on this Northern Ontario community since April 1. 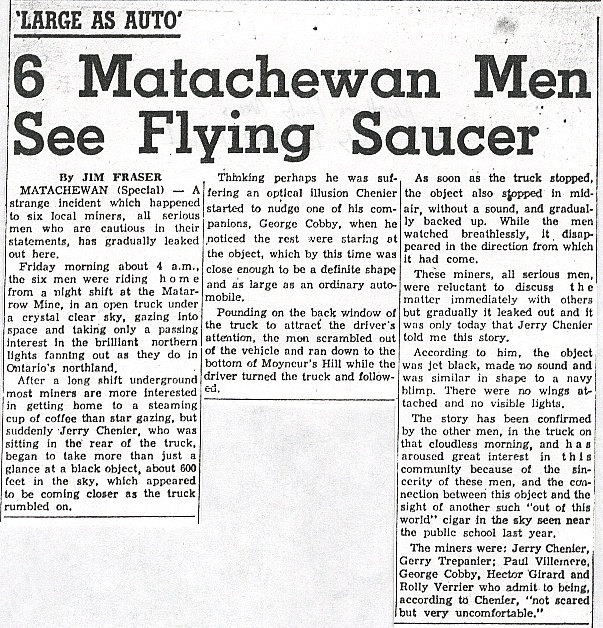 April 7 scores of Timmins residents reported seeing a "ball of flame" which they thought was a saucer. About a week before that, four lumber workers saw what they said was a saucer flying in broad daylight north of the town. 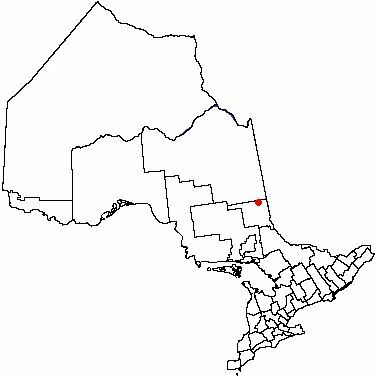 NORTH BAY (CP) - R.C.A.F. officials plan to investigate two reports of flying saucers in this area. The reports came from airmen stationed here. WO. E. H. Rossell, a veteran airmen with 13 years in the service, and Flt. Sgt. Reg McRae, a visitor from Weston, Ont., said they spotted a "bright amber disk" in the sky over the airfield around 8:30 p.m. Saturday. NORTH BAY (CP) - A Royal Navy veteran, employed at the RCAF station here as a mess orderly, said that he saw a "great glowing ball of light" over the station Monday. Henry Durdle, 40-year-old native of Nova Scotia, said the object he spotted just before dawn hovered a few feet above a telegraph pole, shooting out "tremendous sparks like knitting needles of lightning." Durdle said the top of what he saw was circular in shape, about six feet in diameter, with a sort of rectangular box about 15 feet across hanging down underneath. A cone possibly six feet high projected from the circle and at its tip was a revolving globe emitting flashes of light. Frightened at first, Durdle said he watched for a while and then called others to look. Four men did so. Tony McLeod said he saw a glow through a window. Leo Blais said he saw it from a doorway as it was moving away. George Noble, watching from outside, said he saw it moving upwards. Noble said it was a "great, glowing ball, like a pulsating heart." Manley Bailey said he stood with Durdle and watched the object move possibly a mile away where it paused and hovered over a bush. 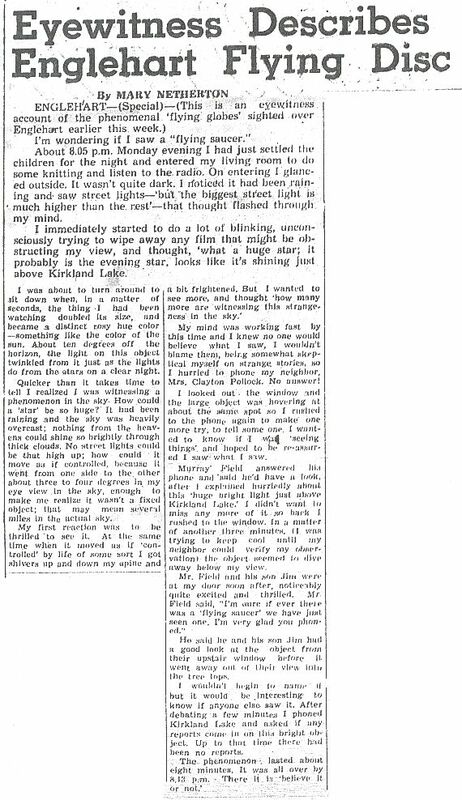 The two men said the light expanded and contracted at about two-second intervals as they watched. Durdle was born in Canada but his parents died when he was a baby. He was raised in Scotland by relatives and served with the Royal Navy for four years. Blue rain and a shining elliptical object, seen to hang briefly in the night sky south of Ramore, before disintegrating into a shower of light particles, don't make a flying saucer. The chances are six to four against, according to Ottawa experts, who, however, place enough substance to repeated reports of mysterious objects in the sky - one only 10 days ago from Boston Creek - to classify all official reports of them as secret. A few minutes after midnight Thursday, an officer of the Ontario provincial police on highway patrol south of Ramore, and unconfirmed reports state, the pilot of an aircraft from North Bay, reported seeing a "mysterious object" in the sky. Official sources, however - USAF radar base at Ramore, and RCAF, Ground Observer Corps and department of transport officials at North Bay - report "no sightings of any mysterious objects in the area during the night." Constable Florian Grabowski of the Kirkland Lake OPP detachment was on Highway 11 patrol, about eight miles south of Ramore when: "I happened to look out of the left-hand window of the cruiser. At about 1,000 feet I saw a shining elliptical object, moving slowly northward over the railway tracks, emitting an intense white light." "Suddenly, just as I was stopping the car to get out and see if I could hear any sound - it disintegrated - in a shower of light particles which fell over the tracks." "I got out of the car, and could hear and see nothing," Const. Grabowski said. He radioed North Bay police. Unofficial sources report that the pilot of an aircraft in the area within a few minutes of midnight Thursday notified his base of making a similar sighting. An official source at North Bay RCAF station stated that "some night flying was carried out during Thursday night" but was unable to say in what area the aircraft were. Two jet fighter planes were reported over Teck on Friday morning by a spotter of the Ground Observer Corps. This "was a routine flight" North Bay RCAF said. A few hours later - at 3:25 p.m. on Friday - William Martin of Grierson road, Federal, called The Northern News to report that at the height of a heavy rain storm . . . blue rain fell, and collected on his window panes. Blake Branscombe, director of provincial department of health laboratories, was reluctant to comment on the possibility of the two incidents - the light in the sky and the blue rain - being connected, or to speculate on the second being caused by the first. Senior physics teacher at KLCVI, Bob Young said today that rain of different colors is not an uncommon occurrence in many parts of the world. This results from particles carried up into the atmosphere, Mr. Young said. Mr. Martin said there were big blue drops of rain running like ink down the pane. At first, they were dark; but after three to five minutes, became a paler blue and in less than 15 minutes, lost all tint to become like ordinary water. "The first thing that struck me is that it was radio-active," he told the Northern Daily News reporter who rushed to his home in time to observe the strange occurrence. "I had been reading in the papers recently where Russia had exploded an H-bomb and that it would affect the rain and weather in Canada." A small sample of the water was taken by this paper and is being sent to the National Research Council at the Atomic Energy Plant in Chalk River for testing. Mr. Branscombe said he was unable to analyse the water as he didn't have the necessary equipment at his hospital lab. "Off hand, however," he said, "my guess would be that it contains gas. Since it lost the color with the passage of time, it may have gaseous rather than chemical content." Meanwhile, the whole question remains a mystery - especially since Mr. Martin vows he hasn't used chemical cleaners of any sort on his window since May. Moreover theory of window cleaners giving color to the drops seems unlikely as many heavy rains have fallen since the time of cleaning and there is no known cleaner on the market having such a dark blue color. "It was like some supernatural power had put them there," said Mrs. Martin who prefers not to venture a scientific explanation of the phenomenon. COBALT (Staff) - 'Flying saucers' are becoming a family affair for the Don Camerons of Gillies, three miles south of here. 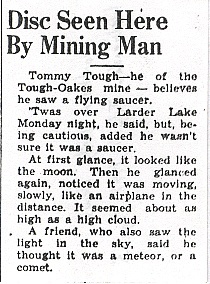 Tom Cameron, 24, and a neighbor, Bob Cole, 28, are just back from cutting ice on Anima-Nipissing Lake, five miles west of Latchford with the latest story in the annals of flying saucers. On Saturday they watched a mysterious object for two hours with binoculars and the naked eye as it played pranks in the night skies. 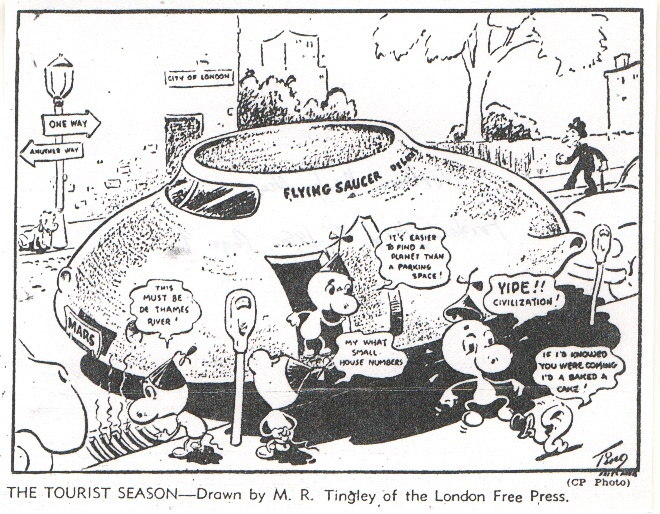 It wasn't the family's first brush with flying saucers. At about 7:45 p.m. Saturday the men were sitting in a shack by the lake when they saw a big circular flare of light in the eastern sky. Above the treetops, it shone green, red and blue. Through the binoculars the object, which they saw was solid, appeared about three feet in diameter. It shot up and down noiselessly and across the skies at terrific speeds "far in excess of those of a jet plane." 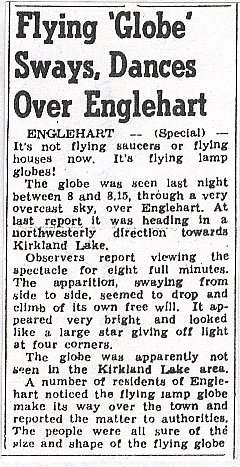 The saucer never went overhead, but went as high as 80 degrees above the horizon. Contacted yesterday by RCAF Filter Centre, officials in North Bay say they have received no other reports from anywhere in the area on Saturday evening. They refrained from advancing any theories as to what it might have been. Don Cameron, his wife and their children had their first brush with flying saucers on April 25, 1946. On the same lake, cutting a channel for their boat, they saw between 12 to 14 small disk-shaped objects come down at a 45-degree angle a mere 75 feet in front of them. Appearing to be about twice the size of a dish, the objects jumped on and off ground of height of two feet, spinning in the ice. The family all watched. As Don Cameron walked toward them, they rose at the same angle and shot off through trees on a nearby ridge without touching the branches. The objects left black marks on the snow and ice. Queried about this, filter officials stated the date and circumstances corresponded to those of similar reports from various parts of the country. Cameron said the objects descended in a chain - "making a rattling sound." They had reported it to no one at the time. 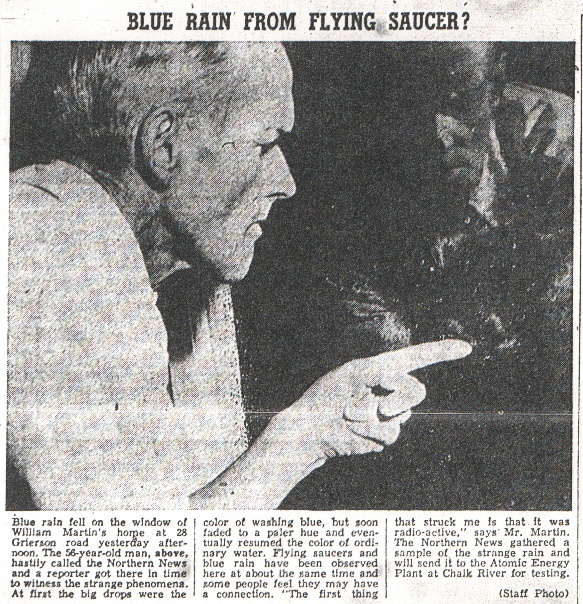 Asked about Saturday's phenomena, Don Cameron stated: "I couldn't see any windows on the flying saucer. It was circular but changed to disk shape according to the angle it was seen from." "We looked at it for two hours and are certain it was no figment of the imagination," he concluded. All news clippings courtesy of The Northern Daily News.